Employee arbitration is the process of using an impartial third-party, called an arbitrator, to settle a dispute between an employee and their employer. It’s the most common form of alternative dispute resolution (ADR). In arbitration, both parties are responsible for preparing materials and presenting their evidence. The arbitrator then reviews the case and makes a final decision, which is binding for both the employee and employer, and generally cannot be appealed. Voluntary: This is when the employee and the employer mutually agree to settle a dispute out-of-court, through arbitration. Mandatory: Also called “forced arbitration,” this is when employment contracts require employees and employers to solve disputes through arbitration. Depending on the stipulation, these clauses may be binding even after an employee no longer works for the employer. It’s more cost-effective. From attorney fees to preparing and filing various documents, settling a dispute with an employee in court is generally much more expensive than resolving a dispute through arbitration. It’s less time-consuming. While court cases can last a year or more, arbitrations are typically much faster. In most cases, arbitrations only take a few days or weeks. It offers immediate finality. Court decisions can be appealed, which often leads to additional court time and fees. However, an arbitrator’s decision is final, binding and, in most cases, cannot be appealed. While many employers include an arbitration clause in employee contracts as a way to help both parties avoid the time, cost and effort associated with going to court, forcing your employees to forfeit their rights to a lawsuit may impact your ability to attract top talent. What are the drawbacks to arbitration? 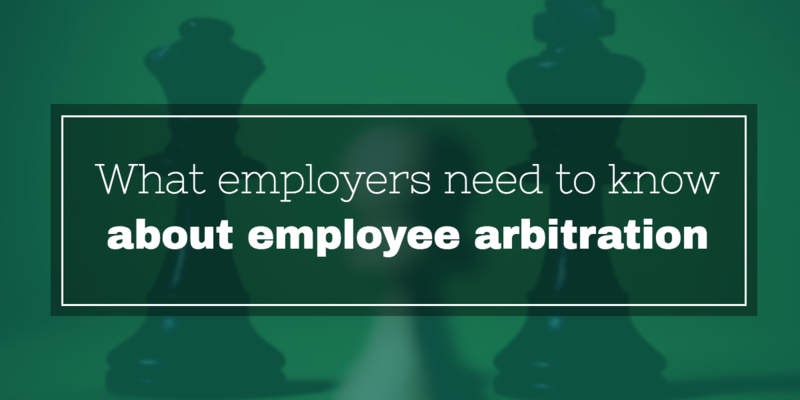 While arbitration may seem convenient and cost-effective, it can also negatively impact your recruitment and retention efforts. Arbitration’s lack of jury can put employees at a disadvantage. While arbitrators are required to be lawful and impartial, employees may feel that they have a better chance at presenting their case before a full jury of their peers. Additionally, it’s much more difficult for either party to request additional evidence in arbitration as opposed to a court case. Because employers have more comprehensive access to information, they may find it easier to maintain the upper hand. Finally, many arbitration clauses also include a class-action waiver, which requires employees to solve all disputes on a one-on-one basis rather than joining collective actions with other employees as part of a class-action lawsuit. But because class-action lawsuits have historically helped employees overcome illegal abuses of power, such as sexual harassment, many people are hesitant to give up these rights — and will fight hard to keep them. For example, in early 2019, Google revoked its class-action waiver after widespread employee protests, and also stopped requiring arbitration in cases of discrimination and wrongful termination. This comes after the search giant waived forced arbitration in cases of sexual harassment and assault in late 2018. Not only did these protests shine a spotlight on Google’s practices, but it also increased professionals’ awareness of employee arbitration clauses in general. In other words, if you do choose to include this stipulation, you can expect plenty of questions and objections. Should you include an arbitration clause in employee contracts? Voluntary arbitration can be an effective and useful method for handling disputes between your organization and its employers, especially when resolving conflicts with union-organized employees. However, a forced arbitration policy can make employees feel like you’re depriving them of the critical rights and protections upheld under the public court system. Also, it’s important to recognize that forced arbitration has its limits. For example, in some cases, such as Samantha Diggs v. Citigroup, Incorporated and Arnold v. Burger King, federal courts have sided with employees and found employers’ forced arbitration agreements substantively or procedurally unconscionable (i.e., overreaching or unreasonable). If you opt to include a forced arbitration clause in your employee contracts, you may want to consider making several exceptions and amendments. Otherwise, you’ll likely risk your ability to hire top candidates and retain talented employees.